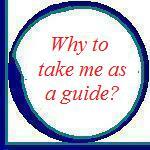 Why to take me as a guide? From Salzburg to or vc-vs or to any other destination see Austria Transfers - Price per Van (max. 08 Passengers).